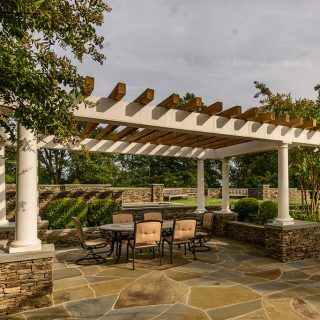 The team at Clearwater Landscape & Nursery offers full-service carpentry design and construction, enabling us to include beautiful custom decks, pergolas, arbors, gazebos, and pavilions into your outdoor-living space. No matter what the size or layout of your back yard, we’ll make the most of it by combining your dream landscaping with custom hardscaping and carpentry for a unified design that flows. Plus, you’ll receive our signature long-lasting quality, so your new deck, pergola, or pavilion will add beauty and functionality to your outdoor space for many years to come. From simple, classic decks to fully covered screened porches, Clearwater will bring you the best in outdoor living with the utmost comfort and style. 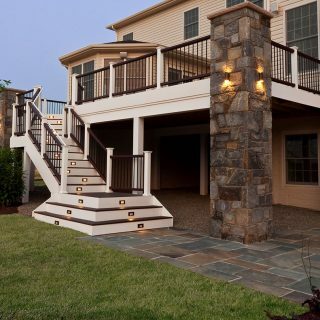 We’re highly skilled in utilizing all types of decking materials, from traditional wood and stains to the very latest in engineered boards, depending on your budget and your preference. Your new deck or screened porch will be a valuable addition to your home that will give you more living space while increasing the value and curb appeal of your property noticeably. Don’t settle for a bargain deck builder. Clearwater is your source for the high-quality deck you really want that will truly stand the test of time. Custom pergolas and arbors have exploded in popularity over the past few decades because they offer the perfect amount of protection from the harsh summer sun with an open, airy aesthetic that won’t make you feel confined. 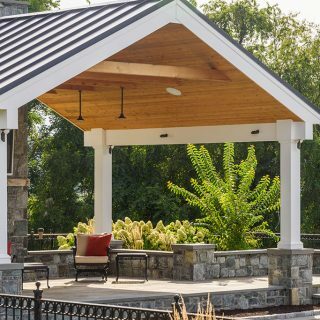 Our pergolas and arbors are available in any size, shape, or configuration, and we’re renowned for our ability to design and install them in perfect harmony with your landscaping and hardscaping. We can even integrate them with outdoor fireplaces, walkways, and sitting areas for a polished, stylish look and added comfort. Adding a custom gazebo or pavilion to your deck or hardscape is almost like adding another room to your home. We can design and build a fully-covered space with integrated electrical, lighting, ceiling fans, and other features that will maximize its value and functionality. With a gazebo or pavilion, your outdoor meals and leisure time will be more comfortable and less susceptible to those pesky summer showers. You can continue to enjoy your outdoor-living space, rain or shine. Plus, when designed and built in conjunction with other features like custom decks, outdoor fireplaces, custom landscaping, and more, your new covered space will be a valuable part of a beautiful whole. As always, our designers and our carpentry experts will ensure its built to last. The Clearwater team has designed and built a wide array of custom decks, screened porches, pergolas, arbors, gazebos, pavilions, and more over the years. We invite you to click below to see our photo gallery of completed carpentry projects.